The Saturday after my first week of work at the Juneau-Douglas City Museum, I headed downtown and ventured up with the Mount Roberts Tramway! 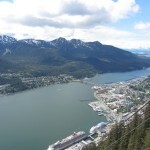 I was 1800 feet above sea level after having taken an aerial tramway up Mount Roberts. 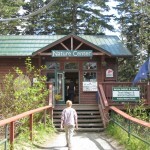 At the top of the tramway is a nature center, a bald eagle habitat, viewing platform, theater, restaurant, gift shop, along with various trails leading up and down the mountain! 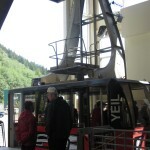 A quick three to five minute ride up with the tram led to several hours of wonderment and exploration! I am not sure what it is, but the weather was absolutely beautiful that Saturday! It was very warm out as the sun was shining brightly. 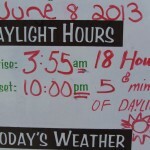 Not only did we have sun, but we had eighteen hours and five minutes (yes, you read correctly) of daylight that day! 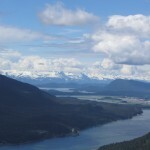 With such nice weather, I nearly forgot that it rained almost nonstop the first few days that I arrived in Juneau! 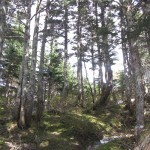 Even though there was snow on the ground at the summit of the tramway, many people were still able to comfortably walk about Mount Roberts in t-shirts! As I mentioned before, a bald eagle habitat is at the summit of the tram. 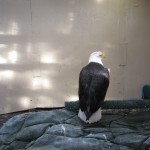 This habitat is operated by the Juneau Raptor Center and provides, normally, a temporary home for injured eagles. While one of its main purposes is to function as a recovery hub for eagles, it also has a means of educational opportunity for visitors. That day, I had a staring contest with Lady Baltimore at the habitat. I was told that her beak was shot and that the impact may have caused her left eyeball to detach. Nonetheless, an eagle with one eye still won at the staring contest! 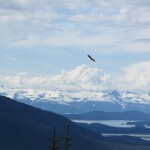 It felt a little odd at first to be at such an altitude, I was looking down at Juneau and seeing the ravens fly below me! However, the view from up there is truly breathtaking. 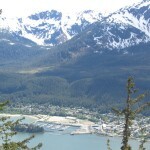 I definitely recommend heading up Mount Roberts if anyone ever travels to Juneau, Alaska!